The poppy display attracted thousands of visitors to St. Mary’s. 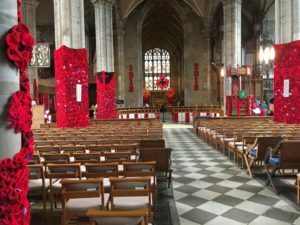 On Sunday 17th February, Warwick Poppies 2018 will be presenting the money raised from the amazing display in St. Mary’s and associated events to our two nominated causes – the Royal British Legion Poppy Appeal, and St Mary’s Church. It will take place after the morning service of Choral Eucharist in St Mary’s at 10.30am. Representatives of both organisations will be there to receive their cheques and there will be a short drinks reception afterwards. All are welcome to attend. Please be in church for 10.30am. Warwick Poppies 2018 was launched early to mark the centenary year of the WW1 Armistice by a group of volunteers who aimed to collect a hand-made poppy for every one of the 11,610 Royal Warwickshire Regiment soldiers who died in The Great War. The response from individuals, schools and local organisations was overwhelming and knitted and crocheted poppies arrived from all over the world. A total of 62,348 poppies were delivered in time for the great display. Many people have asked what will be happening to the knitted and crocheted poppies from the display. A number have already been donated to other churches and organisations associated with the regiment. However, if you would like to obtain some for yourself, Warwick Poppies have organised an event where you can obtain poppies in return for a donation to the campaign. This will take place from Friday 8th to Saturday 9th March, each day from 10am-4pm, in St Mary’s. Tea and coffee will be available.